The former town of Chiran, now part of Minamikyūshū City, is best known for its kamikaze museum visited by many Japanese tour groups. 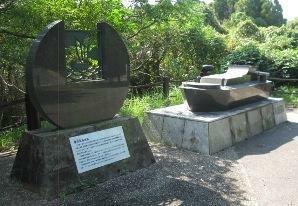 Chiran Town also established a small park at the site of a former Navy shinyō explosive motorboat base, where the shinyō squadron members stationed there prepared to make suicide ramming attacks against American ships if they invaded the Japanese homeland. The shinyō base at Hijirigaura Inlet was located about halfway between Ibusuki and Makurazaki along the southern coast of Satsuma Peninsula in Kagoshima Prefecture. As the situation worsened toward the end of World War II, preparations were made in 1945 for the decisive battle for the homeland, and the Navy's 125th Shinyō Squadron was stationed here at Hijirigaura. It is said that the word shinyō is derived from the phrase "shake the Pacific Ocean." The war ended just before they were to carry out attacks, and fortunately about 180 men departed safely from this place. The shinyō boat was constructed by loading a truck engine on a plywood boat and placing explosive charges in the boat's front tip. Its speed was about 42 km/hour. It was a human weapon when aimed at another ship and then exploding with its crewmembers. Bases were constructed at 114 places in Japan and in a total of 146 places when China, Taiwan, and the Philippines are included . Kagoshima Prefecture had 18 bases, including ones at Bōnotsu, Kataura, Nomaike, Nagasakibana, and Kiire. The funds to construct the monument were donated by 55 former members of the Yokaren (Flight Preparatory Training Program) 21st Class, whose names are listed on a plaque on the right side of the stone shinyō replica. Although the Navy established Yokaren for flight training, at the end of the war many Yokaren graduates were assigned to other suicide units, such as those for shinyō explosive motorboats and kaiten human torpedoes. 1. This statement is incorrect. 56th Shinyō (2004, 7, 162-71) explains that there was a total of 114 squadrons and bases in Japan and other places. The mistake on the monument plaque most likely occurred because the highest numbered squadron was the 146th Shinyō Squadron, but 32 numbers (from 69 to 100) were never used for any shinyō squadron. 56th Shinyō Squadron Member Volunteers, Reiko Kimura, and Enosuke Kamida. 2004. Kaigun suijō tokkōtai: Shinyō (Navy surface special attack corps: Shinyō). Tōkyō: Gensyu Publishing.